As we continue our Lenten journey of an inward look at our lives, we also contemplate the awesome glory of Christ coming in his glorified body at Easter. In our readings this Sunday, we look at two manifestations of our awesome God - the sacred covenant God formed with Abraham and the Transfiguration of Jesus on Mount Thabor. Both are full of rich mystical symbolism. In our first reading (Genesis 15:5-12, 17-18), we hear of Abram's (Abraham before his name was changed) encounter with God as God promised him numerous descendants and also gave him the Promised Land. At Abram's questioning, God and Abram enter into a sacred covenant using an ancient covenantal ritual to establish an unbreakable bond. Much like the disciples in our Gospel reading, Abram was enveloped in a "deep, terrifying darkness". The Lord God took Abram outside and said, "Look up at the sky and count the stars, if you can. Just so," he added, "shall your descendants be." Abram put his faith in the LORD, who credited it to him as an act of righteousness. He then said to him, "I am the LORD who brought you from Ur of the Chaldeans to give you this land as a possession." "O Lord GOD," he asked, "how am I to know that I shall possess it?" He answered him, "Bring me a three-year-old heifer, a three-year-old she-goat, a three-year-old ram, a turtledove, and a young pigeon." Abram brought him all these, split them in two, and placed each half opposite the other; but the birds he did not cut up. Birds of prey swooped down on the carcasses, but Abram stayed with them. As the sun was about to set, a trance fell upon Abram, and a deep, terrifying darkness enveloped him. 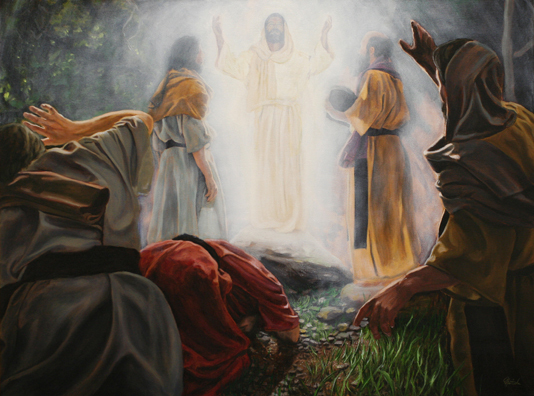 In our Gospel reading (Luke 9:28-36) we hear the awesome story of the Transfiguration. Jesus led his chosen three disciples up the mountain and was transfigured before their eyes as he revealed his glory. They "became frightened" at the sight but then wanted to build tents and savor the moment. There is rich symbolism in this experience, as Moses and Elijah represented the Law and the Prophets of Israel. They discussed Jesus’ “exodus that he was going to accomplish in Jerusalem”, thus connecting all of Jewish salvation history to the final exodus of freedom from sin and death through the cross and resurrection. Fear and trembling, darkness and clouds were often used in the Bible to represent the awe and wonder of an encounter with God. Many of us have had some type of direct encounter with God that has left us filled with awe and wonder. We may want to savor the moment, but rather than stay in that moment indefinitely, we come down from the mountain and go about living our daily lives, just differently.